In part two of this series, entitled “The Tower”, we look at a Sunday morning that many people have come to recognize. Ah, Sunday morning, for some it’s the day where they swear they will never drink again. For others it’s time to go to church and for many generations of black men, women, teens, children, and elders, going to church on Sunday morning became a tradition that for many continue to this very day. For many in the black community, church meant more than just going into a building at around nine or ten in the morning, it was the equivalent of going to a concert. People dressed up in their best suits and dresses, and wanted to look their best, for whom, I was never too sure; judging someone on their appearance while in church isn’t exactly considered “godly” nor is lusting after the opposite gender while praising the lord. The black church is full of a laundry list of characters that sound like the cast of a play that airs on BET on Sunday afternoon. For starters, we have the Sunday school children, yes, Steve Harvey, who mentioned these little hell raisers was dead on when he described these children on a particular stand-up performance as “them badass kids”. I wasn’t one of them; however, I went to school with a lot of these children he described in a very blunt manner. There is also the Sunday school teacher, whom, in my experiences varied in age, most of the time. Sunday school teachers tend to range from their late twenties to even the age of sixty or older and in my experience Sunday school teachers tend to be female more often than not. In this case, it seems that Sunday school and public school mimic each other in that there is small number of males teaching Sunday school when compared to their female counterparts. There are the ushers who usually where white gloves and for some reason still sport jerry curls and then there are the members of the church, we have the elderly women, not just any elderly women; these are the women that every ex-Christian knows about whether they went to church once or their entire youth. 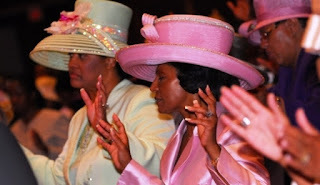 These elderly women are usually revered and respected, they are humble, they are kind, and they are also tough because of the things they’ve been through in their lifetime, however, many of us know them under a different name, the church ladies with the hats. It is also more than likely your mother probably knew who they were. “That’s Mrs. Jackson from down the street”, “that’s “john’s mom, we grew up together!” Even though it’s the first time you’ve seen them. These ladies are dressed as if they are at banquet and are trying to meet the grim reaper, the hats they have on usually cover up bald spots and grey hair and if they aren’t in a wheelchair, they are usually on a cane and they’re probably the reason the line to the entrance to the church is usually overcrowded with attendees that are engaged in conversation or just simply standing around waiting for church to begin and end so that they get home and watch the game. Those hats, how does one begin to describe the flamboyance of these hats? Well, I can tell you this, if happen to sit behind an old lady with a plantation hat that resembles a flower bouquet repeatedly saying “Amen! !” loudly, you know have just found one of these church ladies and her hat. These hats come in very many shapes, colors, and sizes, and usually have anything from flowers, bows, and probably even the entire bible sticking out of them, and that’s just one hat, I don’t think I want to know what granny might be packing in those other ten ton hats she has laying around her house. We also have the guests. If you’ve ever been a guest in a church, it is extremely awkward when the pastor or the announcer has all the guests stand up. I’ve been in that position a number of times and it’s rather strange to have everyone looking at you while you’re still waking up from either staying up too late or having your usual weekend meetings with Jack Daniels and Captain Morgan. We also have the church piano player, an old lady usually playing a wooden piano that dates back to the civil war and usually playing a bit off key. And now, without further ado, we present to you, the heart of the black church, the reason everyone in the church stands up, the reason you know at least 100 old time church songs, and the reason your grandmother is singing loudly and the tambourines are shaking loudly, hailing from various parts of the United States of America, the church choir!!! And, introducing the head of the church, allegedly representing Jesus Christ formerly a pimp, a drug dealer and gang member who apparently found Christ while in prison, he’s the reason your grandmother says amen every Sunday morning , the pastor!! Well, it’s Sunday morning and the pastor is preaching and you know the routine, today’s sermon will be about the good lord, and Jesus Christ and all his blessings!! We will talk about how he blessed all of you and led me out of the mean streets of Tulsa, to jail, to his anointing, his blessings, and this two hour sermon this lovely Sunday morning! Open your bibles to genesis, and we will start from the beginning, how god created the earth, how Adam and Eve sinned, and how our community is in shambles because apparently a woman bit on an apple after being tempted by a snake in a garden about 6,000 years ago. That woman sinned AH! In the garden AH! And after sinning AH! She apparently, caused a curse to come down upon us! And we have all fallen short of the glory of god because of one woman!!! THAT JEZEBEL!!! Evvvvve...ah!! Our community is in shambles because of this woman, our children are killing each other because of a woman eating an apple in a garden and disobeying god! Now I’m going to explain this logically, because a woman ate an apple in a garden, and because we didn’t pray enough, we have fallen short of the glory of god. It is now time for the collection plate to make its way around; now, we at the church are not interested in money, but furthering the kingdom of God through tithing. Now when you tithe, remember that you are contributing the kingdom of god! Not to my wallet. Now what is this kingdom of god? The kingdom of God is the kingdom that you will see when you leave this earth! Hallelujah! Amen! Now, that the tithing is done, we can get back to worship! We can get back to getting the Holy Spirit! Yes, we are coming to the end of the service, but don’t forget about god when you leave the church! Can I get an Amen in here?! AMEN PASTOR! Church is dismissed! This is some insight into a black church service, although, experiences may vary from person to person. Now that you have left the church feeling good about the sermon and empowered, you feel blessed and think Jesus is going to save the day again. Unfortunately, that’s only a dream and reality sinks in. You drive through the neighborhood and see the same horrible, downtrodden, broken reality of a poor working class neighborhood, you see the prostitutes walking around the streets, the drug addicts, the Nation of Islam members pushing their Final Call newspapers on one corner, and the Hebrew Israelites on the other corner preaching about god and his wrath, the bootleggers slinging their bootleg, or even stolen DVD’s CD’s, cologne, perfume, shoes, clothing and jewelry, the Jehovah’s Witness members walking from door to door. As you get home you hear the all too familiar sound of emergency sirens blaring loudly, and a helicopter flying over your house. Now, you’re thinking to yourself, why is this all happening? Why is there so much chaos? With all these churches, mosques, preachers, ministers, and the power of God, why is there so much chaos? I pray, I fast, I tithe, but, why is there so much chaos? It’s the work of none other than… pom, pom, poooommm… THE DEVIL! That devious, evil creature with a pitchfork is once again causing all of these problems! Alongside his army of demon minions! We have to prepare to battle the enemy! Who is the enemy?! The devil and is demons that come in many forms including but not limited to, drugs, prostitution, gangs, gossip, and that evil spirit of homosexuality! I don’t see the logic in all of this, but this is what the pastor said to do and that it is the will of God and his son Jesus! So I must follow his orders. This is some insight into the mindset of some, but not all of the Christians I’ve come across; however, this is only an ice shard in the large river of Christianity and its history within the black community. I will address a large amount of almost cult like behavior from black Christians, and much more. Coming soon: The Tower Part 3: Smoke Fills the Building. ExChristian.Net: Part Two: Amen Pastor!